Pick up a Staples gift cards online at a discount and stock up on everything you need to make your business a success. From laptops and tablets to furniture, luggage, business essentials and more, there’s something for everyone at Staples. Plus Staples gift cards can be redeemed in over 1,500 stores nationwide as well as online at staples.com. 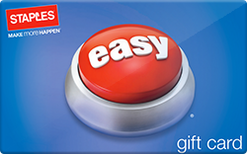 Give yourself the gift of choice with a Staples gift. Shopping Tips: Staples eGift cards can be redeemed in store and online. Buy Staples gift cards online at a discount to save money on all your office supplies needs. Does Not Expire. Below is a listing of our favorite places to buy Staples gift cards. There are always great deals and discount available when buying these so check back often. We will keep this list updated to reflect the best rates when possible. Office supplies… check. Savings… check. With discounted gift cards you can save every time you need that productive something from Staples. It’s that easy! The gift cards never have extra fees and do not expire. Read more on Gift Cards Discount Rates.